My name is Christine Parker and I live in Southern Oregon with my husband and daughter. While living in California and then moving to Medford, Oregon I worked in the Veterinary Medical field as a Licensed Animal Health Technician. I have been training dogs in obedience for over 35 years and have shown dogs in conformation for over 30 years. During my years of showing I put Obedience titles and Championship titles on a wide variety of dogs and also put a number of Dog Agility titles on my Australian Shepherd. When not working with other peoples dogs I spend time with my husband and daughter, along with our "extended family" which includes horses, cats, a flock of chickens, turkeys, several sheep, and our three wonderful dogs; "Chunk", an Australian Shepherd, "Meme", a Schipperke, and "Fayla", an Australian Cattle Dog. 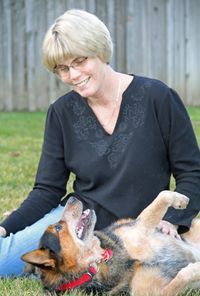 At Manners For Your Mutts my goal is to help you and your dog to communicate better with each other and have a happier and more harmonious relationship. I want to help you to understand how your dog thinks and help you and your dog to work together as a team and have fun while learning. Training is tailored to the needs of both you and your dog. Your dogs age and temperament are always taken into consideration and you will both be treated as the individuals you are. Training will begin at your home and as we progress we will move our lessons to a more public area to be sure that you and your dog are able to work together in a more active "real world" type of environment. While my early years of training mostly involved putting obedience titles on dogs, or helping owners train their dogs towards an obedience title, the majority of my training is geared towards helping the family dog to become a well behaved and welcome member of the family. Although my main focus in training is working on improving the behavior and relationship with the family dog I can certainly help you if you are interested in training your dog towards an obedience title. Why Choose Manners For Your Mutts? * Would you like to have personalized attention for you and your dogs training? * Would you like to have training that is tailored to the specific needs of you and your dog? * Have you and your dog tried but failed at group dog training classes? * Or worse, have you and your dog been kicked out of ... I mean... "asked to leave" group dog training classes? * Does the schedule of group dog training classes not fit with your schedule? * Call Manners For Your Mutts Dog Training and get individualized help in classes held on a day and time that works for YOU. * Do you use two collars on your dog; one collar that is safe for your dog to wear every day and another collar for walking your dog? * The Keep It On Collar is one collar that does it all! patented Keep It On Collar at www.keepitoncollar.com "Like" us on Facebook! "Because you love your dog"